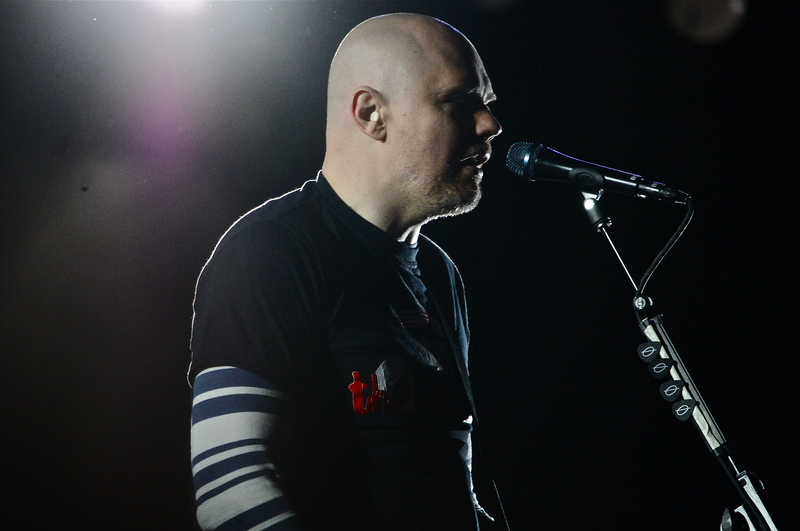 TORONTO, Ontario – The Smashing Pumpkins led by Billy Corgan descended upon the Air Canada Centre Thursday Evening. Corgan and the latest version of his band, bassist Nicole Fiorentino, guitarist Jeff Schroeder and drummer Mike Byrne showed why they still have so much more to offer. At one point Corgan said many cynics expected this band would not last or succeed. An estimated crowd of slightly over 10,000 strong cheered as he told them how they helped prove the doubters wrong. The Pumpkins started off by playing their latest release Oceania in its entirety from start to finish. Oceania is the bands eighth studio album, their first since 2007s Zeitgeist. The stage featured a large round screen above the band that displayed images of varying kind to accompany the songs. Corgan pretty much let the music do the talking for the first part of the show rarely stopping to talk much. Songs that stood out would include “The Celestials” and “Pale Horse” which featured a memorable riff. As the band broke into the second half of the show Billy mentioned how he was talking to his bandmates and said how he played at the fabled Maple Leaf Gardens which got a loud applause from the crowd. Billy also mentioned how he has a wrestling promotion and how he’d like to bring it toToronto for a show someday. Highlights among the second set include a ferocious version of “Bullet With Butterfly Wings” and an arousing “Today” which probably received the loudest reaction of the night from the crowd. Concluding with “Zero”, the band received a well deserved final applause as the show ended. Billy Corgan’s statement earlier in the night had me thinking. Obviously he has moved on with his current bandmates. There really is no need to go back to the past as Corgan and company have released their finest album since Mellon Collie and the Infinite Sadness in Oceania. With the way they performed the older material Thursday evening it appears they are carrying on without missing a beat.